Drift Creek Falls Trail is a 2.6 mile heavily trafficked out and back trail located near Cutler City, Oregon that features a waterfall and is good for all skill levels. Flanked by ferns, alder trees and vine maple, Drift Creek Trail winds through the rain-drenched Siuslaw National Forest. 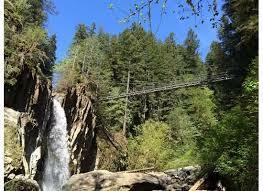 The highlight of the trail is a 240-foot long cable suspension bridge. Anchored by cables and ties that are cemented into opposing bluffs, the bridge holds over a hundred fifty thousand pounds. While the bridge does offer a bit of a bounce, the thirty-inch wide tread is perfectly safe and the bird’s-eye view will leave you spellbound.